Fat Bruce Lee and I had been doing some research to find a truly great burger in Los Angeles, and Wolfgang's Steakhouse in Beverly Hills came up as a candidate. This was one of 5 locations that Wolfgang Zwiener had opened. Herr Zwiener was formerly the head waiter at Pete Luger's in Brooklyn, NY, and he created a series of classic steakhouses based on his years of experience. The guiding hand in the kitchen of the Beverly Hills location was Chef Cid Gonzalez, and Chef Cid was present on the day of this review. Oh, free parking for two hours in the lot below the building. 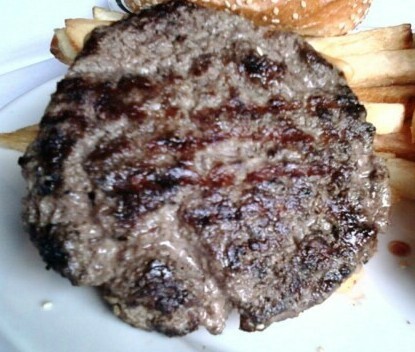 The Beef: 8+ ounces of coarsely ground beef sourced from of U.S.D.A. Prime cuts of Angus, which was aged on-site. This burger tasted of cuts of beef taken from the proper half of the cow...the back half. 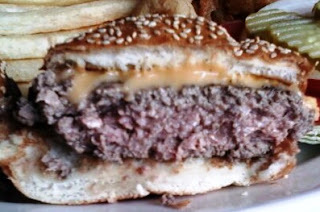 Upon biting into this cheeseburger, I was happily surprised by the rush of funk, mineral notes, and strong beef flavors. It was a phenomenal first bite--it was so good, that I cut a piece off for Fat Bruce Lee (on a diet) to taste so the could make certain that I was not having a horribly generous day. Fat Bruce Lee concurred--it was a gorgeous bite of beef. The Sear: It looks like the got some spotty grill marks onto it and then transferred it to a broiler. The photos demonstrate that it was grilled, but the half sear on the rest indicates that something else was going on. Additionally, the dark patches on the cheese show that a broiler was used. That said, the sear was weak--this burger would have benefited from a crunchy, crusty sear. The Preparation: Med-Rare as requested. The beef was ground coarsely. The huge burger patty was very loosely packed and somewhat irregular in shape. This created a variety of cooking temps on the irregular surface, and that led to a very savory flavor profile, since certain areas were cooked harder than others. Additionally, the mouth feel was dead on, because the burger was thick enough to be cooked on the outside while leaving a juicy core of nearly raw, ground steak in the center. The burger ended up being pleasantly juicy without being greasy. The Bun: The bun was darn good. It was toasted on both sides, white, seeded, and fluffy. It appeared to be a little pillowy, at first glance, but this slightly sweet bun yielded easily, and the resultant bundle of compressed gluten strands made it toothsome without any chewiness. The sesame seeds provided a small but satisfying crunch in each bite. This bun was provided by BreadBar, and was the same bun that BreadBar used for their burgers. The Seasoning: They dusted the burger with a nice seasoning blend. It seemed that the spices were finely ground before being applied to my burger. I grind my salt and pepper together with a mortar and pestle to achieve uniformity, and I got the impression that a similar level of care was taken at Wolfgang's Steakhouse. As for the interior...it was hard to say--the richness of the steak flavors were all that I could taste. The Cheese: Properly melted American--they broiled the burger after they applied the cheese, so even the cheese had a sear on it--this was similar to the burger at BLVD 16. Meat to Bun Ratio: Perfect. One would expect that massive burger patty to soak through that bun, but the bun held up through the last bite. The Fries and Rings: They served both fries and rings with the cheeseburger. 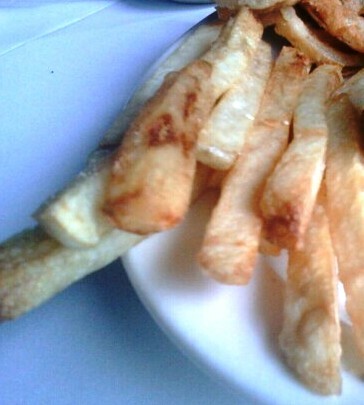 The fries were 8 inch long, 1/3 inch thick squared cylinders of firm potato. They were slightly refined steak fries, so they were hearty. The rings were thickly cut onion dipped in a flaky batter, which managed not to be overly greasy. Like the fries, the earthy, root vegetable flavor came through. The Value: The enormous cheeseburger (I could only eat 1/2, but I wanted to eat all of it), fries, and rings was only $14. It was enough for 2 meals--my leftovers were enough for dinner. Considering the quality and sheer volume of food, it was a very good value. While I kept the vegetables on the side, I made a point of sampling them. The tomatoes at Wolfgang's Steakhouse were completely respectable. Chef Cid clearly took the time to inspect his own produce. That is rare. 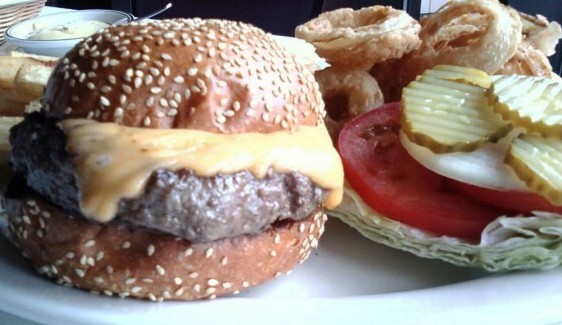 The burger is on the lunch menu, but if you ask really nicely, they will prepare this for you at dinner time, as well. 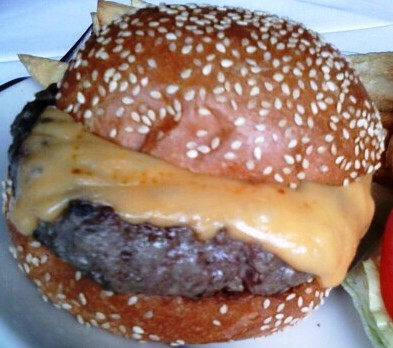 Burger Review : This was the best cheeseburger that we have tried in Los Angeles. The burger at Umami tasted clever and "photoshopped" when compared to the powerful, honest flavors in the burger at Wolfgang's Steakhouse. Wolfgang Zwiener and Chef Gonzalez....we salute you, and we thank you for setting the bar in Los Angeles when it comes to excellence in burgers. 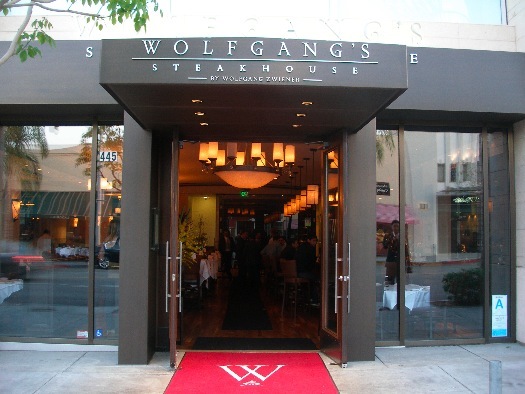 Editor's Note: We returned to Wolfgang's Steakhouse on 08DEC10, and things were very different. The dining room smelled a little/lot like sour mop water, and there was a thick layer of dust on every horizontal surface except the tables. Chef Gonzales was not in the kitchen on that day--Chef Jaime was running the show. Even though there was only one table seated (10 top) in the entire restaurant when we walked in, AND that table had already placed their order, the kitchen's first attempt at my burger came out after a 40 minute wait. The fries were undercooked, not crisp, and under-seasoned. It was merely an average cheeseburger--3 Bites.This was based solely on the quality of the beef. Still not seared as well as what we saw on our initial visit but an improvement. It was like a different kitchen prepared my burger. This was a damn good cheeseburger 4.5 Bites. 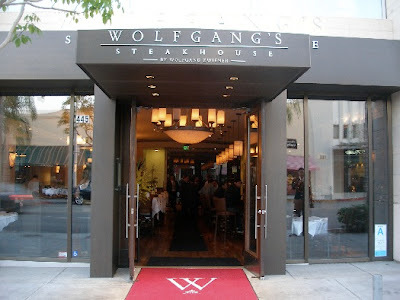 Accordingly, we have reduced Wolfgang's Steakhouse's 5 Bites rating to a 4 Bites rating. Consistency is key--Umami Burger has managed to put out a quality burger every time that I have visited, and Wolfgang's Steakhouse fell well short of the mark in that respect. This was a matter of attention to detail in the kitchen, and on this visit, that attention was sorely lacking. In fairness, the burger was comped by our waitress, Jill. I have walked by this place numerous times and often wondered. I will definitely give it a shot now. Thanks for the spelling update. Your Father-in-Law is a talented man. If your spouse picked up some of those skills, then you must be very happy!